Well, I have been a bad, little blogger! 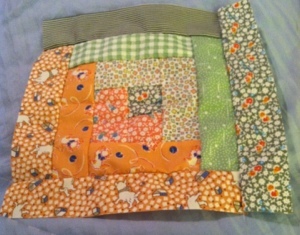 I have been keeping up with the quilting though, just not as much as I would like. The main reason for my lack of “blog” is that I started grad school in January. The process started in October and I have been solely focused on applications, papers and qualifying exams. I am now officially a credential student working towards a Multiple Subjects Teaching Credential! My first semester was action packed and a big wake-up call about what the next year is going to look like. 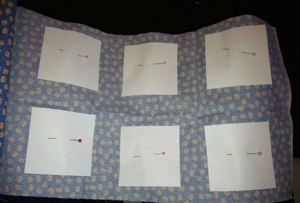 Between school, work and classroom observations, I barely had time for anything, let alone quilting! Yet, I managed to squeeze in a few hours of work here and there. The good news is that I will have some breathing space this summer. I have about 3 and 1/2 weeks before school starts up again, and currently I am not working. I had to quit my job to accommodate school, so now I am looking for a restaurant-based job that will offer me more flexibility. I am also busy working away at my 1930’s Hexagon Quilt. I am hoping to get a lot of sewing done in the next month, so stay tuned! 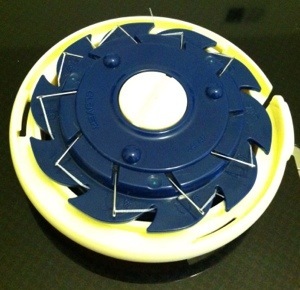 I’ve been working feverishly on the baby quilt for my friend’s impending delivery, and I’ve discovered two new tools that are great for projects! 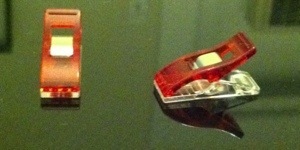 The second are the wonderful Clover Wonder Clips. These curved clips are designed to help keep binding in place in lieu of pins, but they are also great for paper piecing. 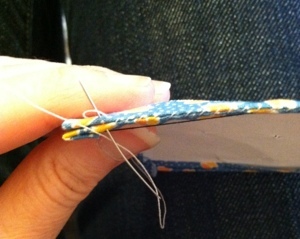 I use them to hold the fabric in place when basing, then to help keep the pieces together when whip stitching. My fingers tend to cramp up when I hold the pieces together, so having a tool to keep them in place instead has been great. It’s official- I am a crazy quilt lady! I just got back from a 2+ hour trip to buy fabric. 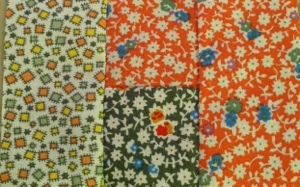 Not just any fabric, but THE perfect fabric to use as backing for the Red Riding Hood Quilt. I first found it at my local Jo-Ann Fabrics, but sadly, they didn’t have the yardage I needed. The lady at the cutting table looked it up for me and found that the San Leandro store had 15 yards in stock. She gave me all the information I needed, and I pondered a trip to the East Bay. During the week I looked the fabric up online (sold out) and found another suitable choice (they only had one yard, but you have to buy 2 to purchase online). 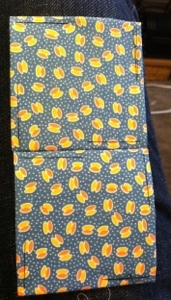 Since I was pretty much SOL, I called the store and purchased the fabric over the phone. It’s a good thing I did as they were almost sold out. Apparently this is REALLY popular fabric! Today I battled the traffic in the East Bay and got my perfect backing! It’s the start of the month, and time for “The State of the Bag” Address. Here is the status of all hte bag projects (and a couple other things). * 1930’s Hexagon Quilt: I have finished six rows and am in the process of attaching the sixth row to the main body of the quilt. I have set the goal of one row a month. Let’s see if I can keep that pace! * The Honeymoon Quilt: This quilt is so close to be completed! I am filling in the last row and will check it to see if I am happy with the look. If not, I will need to add another row. The goal for this month- FINISH IT! * The Creepy Kitty Quilt: Four blocks are done, five are left! I want to have all the blocks completed by the end of the month and be ready to set the sashing. * 1930’s Log Cabin: I didn’t meet my goal of finishing stage five by the end of the month. I was supposed to do it last night, but I have come down with my annual cold, and the idea of sewing was too exhausting. I am going to work on it this weekend. The goal for the month: finish stage 9. 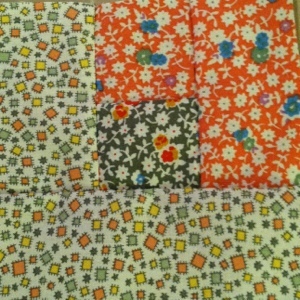 * Kath’s Baby Quilt: This just came in the bag, and I am in the process of prepping the squares. I also have to re-do the quilt layout to accommodate the border (plus I need to find border fabric!). The goal for the month is to finish the fabric prep and complete the first two rows. * The Red Riding Hood Quilt came out of the bag, and I need to finish it this month. I need to trim up the fabric, get the batting, backing, binding and tying materials and complete the quilt. I am going to work on it next weekend and will post pictures! 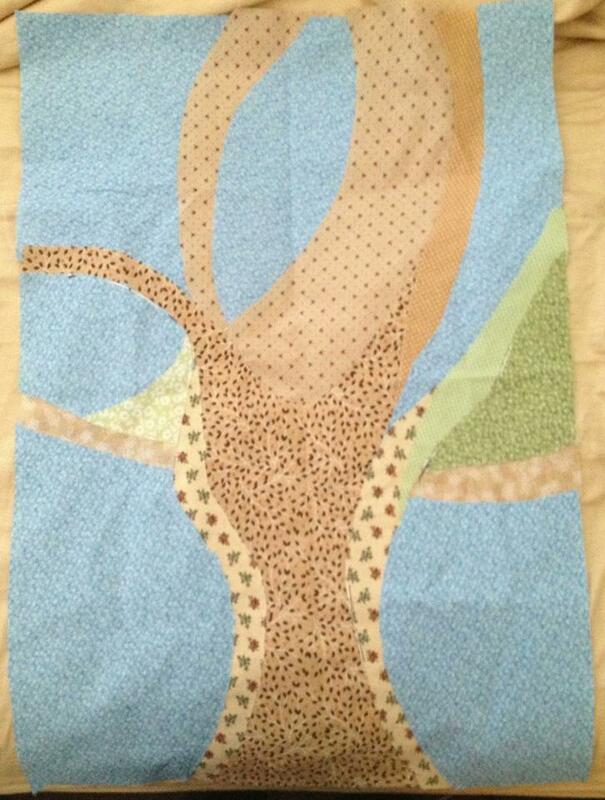 * The Story Book Quilt: Remember this one! It has been sitting on my shelf for ages while I figure out what to do with it. 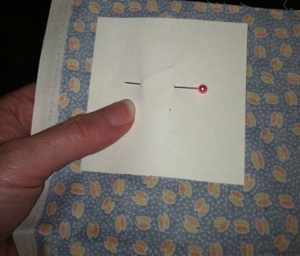 I am going to quilt it, but I am going to use embroidery floss so that the stitches are very decorative. The binding is done, I just need to iron it. This is another project that will be worked on next weekend. * Star Wars Snuggies: The special Giant’s game is Monday, so this weekend will be spent finishing up the Snuggies. They are almost done, I just need a couple of hours to finish everything. So that’s the State of the Bag with my goals for the month! Exactly one month ago I started my new “In the Bag” system of organizing my projects. I am happy to report that it has been a success so far! In this month I have completed one quilt top, made significant progress on four others, started a new quilt, completed a Snuggie and am almost finished with another Snuggie. For me, that is huge! I think the reason why this is working, is that I have modified a system that already works in my work life. By having realistic goals, and reducing the projects to a manageable size, I have set myself up to succeed, not fail. 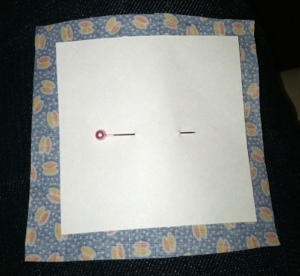 Additionally, I am keeping myself accountable by keeping a sewing journal. 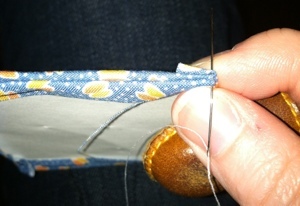 Every time that I sew, I write in the journal either about that day’s work, or ideas for upcoming projects. Also keeping me on track is the at least eight hours of sewing that I dedicate to working on projects each week. By sticking to that, I am able to see real progress each time I sew and that gets me excited. Before, I was only seeing the hours and hours of work ahead of me, now, I am seeing all the hard work I have done translated into lovely quilts! 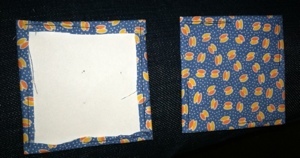 I started on my friend’s baby quilt today, and since I am using the English Paper Piecing method to put it together, I thought this would be a great opportunity to show a step-by-step of paper piecing. Disclaimer- I learned this method by looking at articles online and trial and error. I am sure that I am not doing everything “the proper way” but this is what works for me! When I get farther along, I will demonstrate joining rows and corners! Perhaps that is why I am drawn to the Log Cabin Block. This classic quilt block is almost, but not quite a fabric version of the Fibonacci Sequence. Eventually, I’d love to do a true Fibonacci Quilt, just to see what it would look like! After a long day of sewing, the Red Riding Hood Quilt Top is DONE! I need to trim the edges, and decide on backing and binding, but that is the fun part! Now the baby quilt for my friend is officially in the bag! A friend is having a baby, so I must make a quilt for the new soon-to-be “Bean.” Bean is a boy, and I luckily just got a perfect fabric set to make him a quilt. So, I thought I would take this opportunity to share a little about my creative process. Once I have the fabric, I decide what type of pattern and method I want to use. 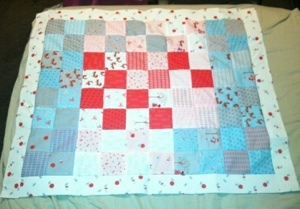 For a baby quilt, a very simple patchwork with squares is best. I plan on using 3″ squares using paper-piecing to ensure that I have nice, even squares. Now comes the math. 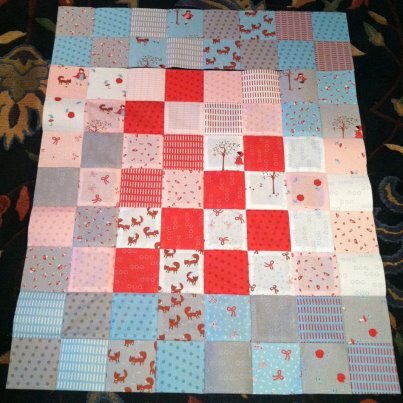 A standard crib quilt is 52″ X 34″ but since I am using units of three, I had to increase the size to 57″ X 36″. That means it will be 19 rows long, and 12 columns wide, which translates into 228 squares. The next step is finding out how many squares I will need of each color to make sure that I have enough fabric to complete the quilt. 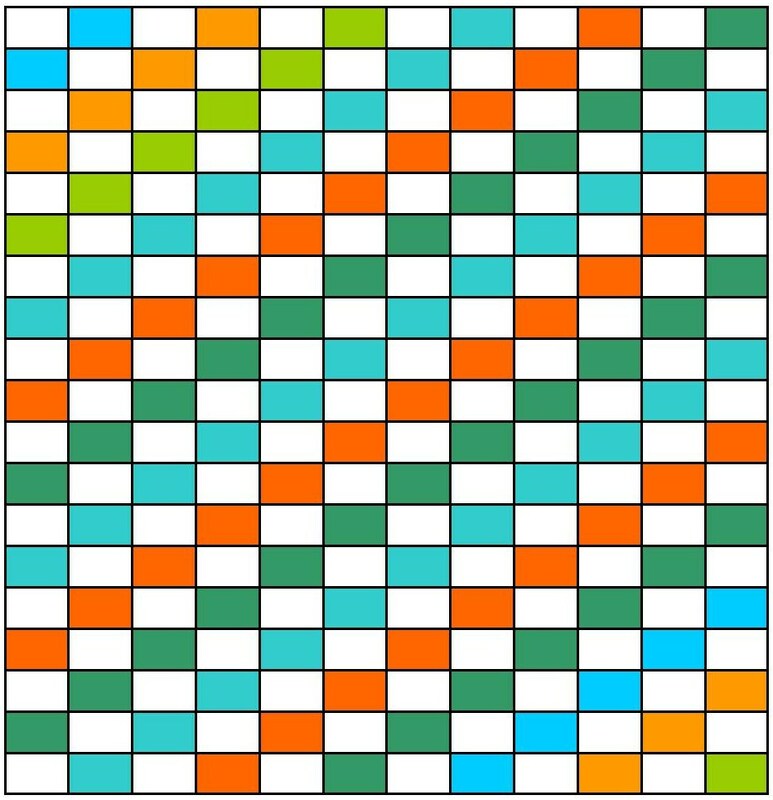 The break down is: White- 114, Small Blue- 7, Small Orange- 7, Small Green- 7, Large Blue- 31, Large Orange- 31, Large Green- 31 (small and large indicates the smaller or larger cuts of fabric). Based on these numbers, I am fairly certain I am going to need more of the plain, white fabric, but that is easy to acquire. The final step in the design process will be to layout the 3″ paper squares on the fabric to confirm that I have enough fabric to do the pattern as envisioned. If not, I will go on a fabric hunt to fill in the pieces! I will start this quilt as soon as the Red Riding Hood one is done. Thanks to the Olympics, I spent a large chunk of the day parked on the couch sewing. 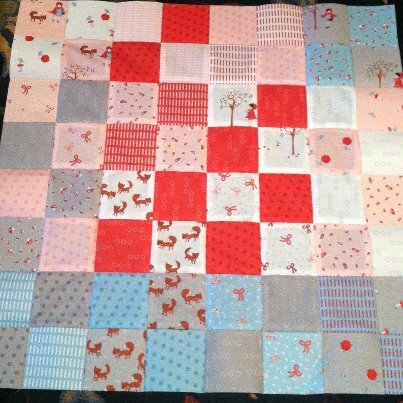 The result, I am nearly finished with the Red Riding Hood Quilt! I’ve ordered a yard of one of the fabrics to use as a border to finish it off. Hopefully that will get here in the next week so I can move this one out of The Bag!